If you’re looking for an extra-cash gig that’s like Amazon Flex, DoorDash and Uber Eats, Postmates is hiring Couriers to make local deliveries in their own cars. You’ll be taking food or merchandise to customers on your own schedule. Pays a median of $19/hr. during peak times, the company says, though that’s based on an older TechCrunch interview. The average range appears to be about $9-$15 — depending on location, surge pricing, etc. If you decide to become a Driver, there are ways to increase your pay. For example, stacking up your deliveries, or going to “hot spots” — locations where a lot of deliveries are being made. 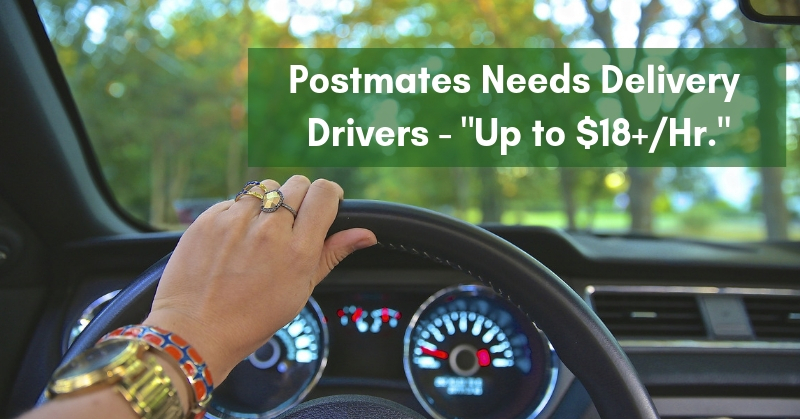 For more tips on boosting your pay, see this article on Ridester, a site that specializes in on-demand Driver content — 11 Unique Tricks for Earning More Money as a Postmates Courier. Postmates is active in several hundred metro areas across the US. For the list, click here and click on “View More.” For Driver FAQs, click here. To apply for the job, click here. For more jobs like these, check our Newest Jobs & Gigs page. To be the first to hear about jobs, like our Facebook page and check your feed for our posts. Good luck in your rebellion!